What a week it was! I am talking about last week here in UK. Just when we were getting ready to welcome winter, the weather gods decided to play some joke and have a dig at us. The temperatures shoot up from mere 10-13 deg C to soaring highs of 30 deg C!!! Yes, a whooping 30 ‘bloody hot’ degree C!!! 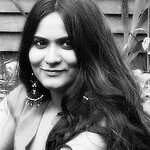 I must admit that I enjoyed every bit of ‘Indian summer’ in UK autumn! Since Lil dumpling was poorly, HD and I took turns to take day off from work and stay at home and we made most of the weather by staying cool at home during day time and playing in the garden and cooking some BBQ in the evening. After drowning in gallons of cool drinks, ice creams and cold sandwiches, it came the time we craved for some good homely food. But slaving in the hot kitchen atmosphere was not very pleasant thought. However, I didn’t want to spend more than 15 minutes in the hot furnace aka my kitchen. And it was the biggest challenge for me, who usually spends at least an hour to cook some delicious home meals. In the end, two things came to my rescue, my ever faithful pressure cooker and my new friend (or foe, the debate goes on!) sleek, shiny and energy efficient electric oven! I just dumped lentils, roughly chopped tomatoes, green chilli and ginger in a pressure cooker with turmeric powder and salt to taste and delicious bowl of simple yet comforting bowl of Dal was ready in few minutes. While Dal was getting ready, I literally dumped big cauliflower florets in boiling water and let them sit for 5 minutes which gave me plenty of time to prepare the spice mix and pre-heat the oven. 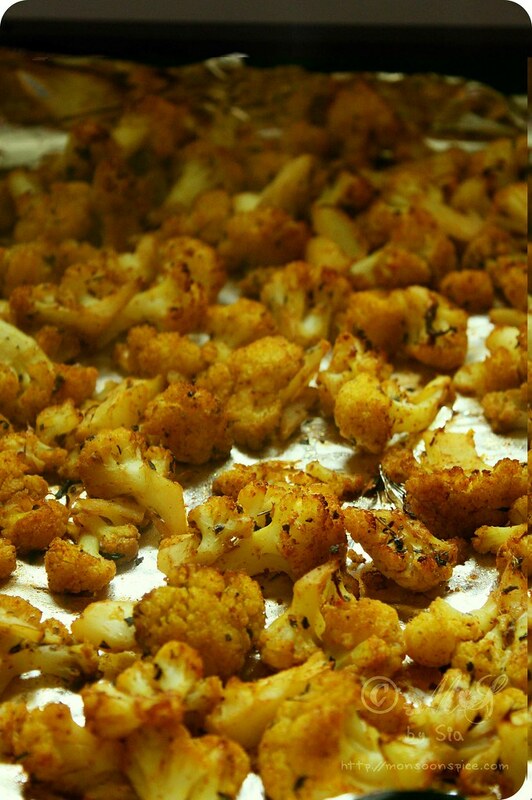 Strained and then dusted with aromatic Indian spices, the cauliflower florets were ready to be oven baked for delicious Spicy Gobi/Cauliflower Roast. Just 20 minutes in the oven, these crispy and highly addictive Spicy Gobi/Cauliflower Roast was ready to be served with a bowl of creamy Dal and store brought soft Garlic Naan and some plain Rice. A delicious meal cooked well under 30 minutes. And the best thing is it just takes under 15 minutes of your time to prepare this delicious spread!!! Did I just hear unbelievable? Believe me, it is believable ;) Very much believable! 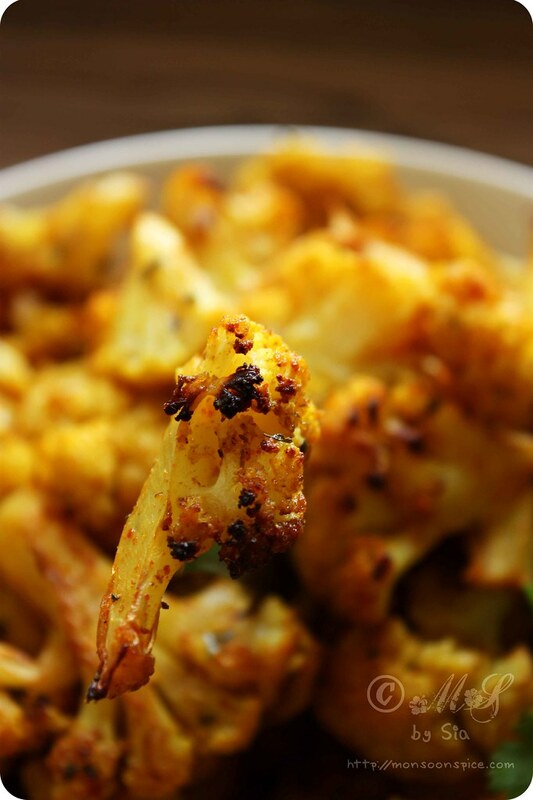 This Spicy Gobi/Cauliflower Roast is indeed unbelievably simple, quick, delicious and highly addictive. But wait a minute, there is more! You can also make it guilt free indulgence by omitting the use of oil. Yes, you can make it absolutely oil-free and yet enjoy delicious food. I have made it many times, some times with oil and some times without any oil. And even when oil is used, it is just a table spoon which you can forgive and forget! 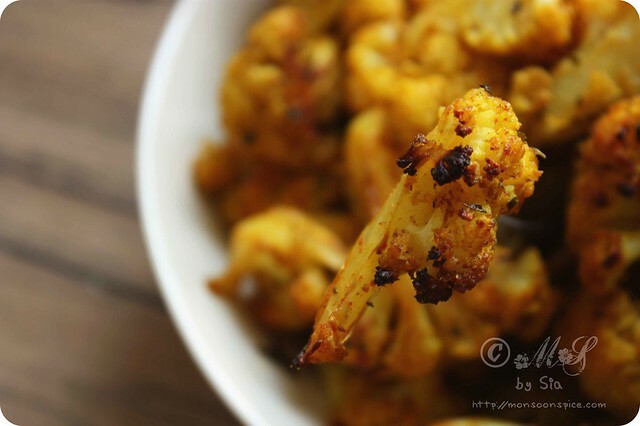 I am just surprised as what stopped me from posting this gem of the recipe of Spicy Gobi/Cauliflower Roast and sharing it with all the readers of Monsoon Spice. You can serve it with any plain of flavoured rice or with any Indian flat bread. I have used it in wraps with a spoonful of sour cream and salad leaves and it tastes absolutely delicious. 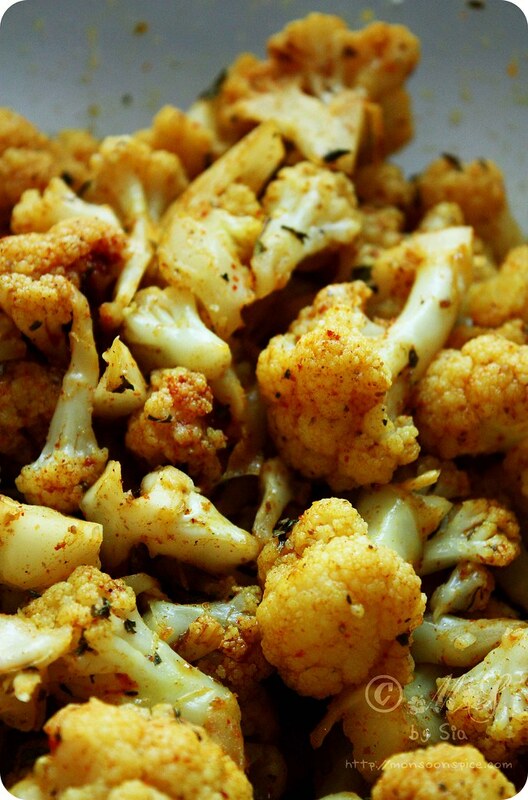 So without much delay, let me share this wonderful recipe of Spicy Gobi/Cauliflower Roast. Pre-heat the oven at 180 deg C and place the rack in the centre of the oven. Cut cauliflowers into medium sized florets and transfer them to a large vessel of boiling water, with turmeric powder and about a teaspoon of salt, for about 5 minutes. Drain all the water and transfer the cauliflower florets to large mixing bowl. Now add all the spices listed along with oil and salt to taste and mix them well so that every individual floret is coated with spices. 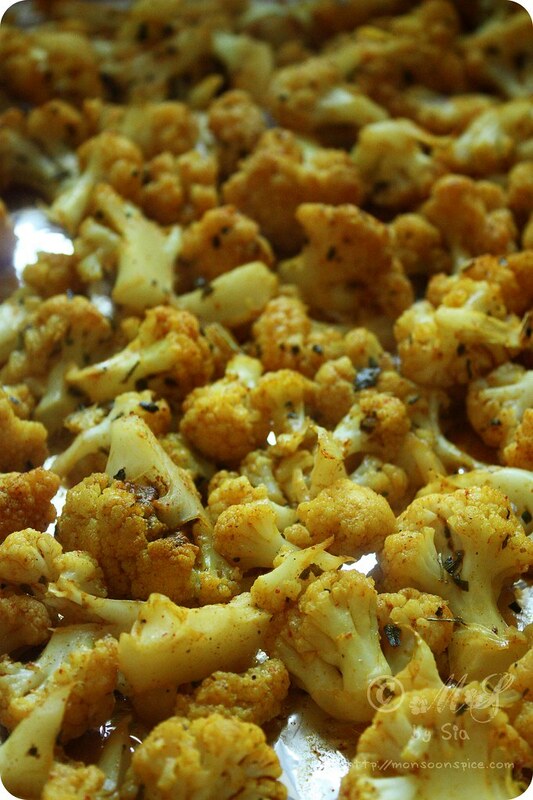 If you have time, let it marinate for 10-15 minutes so that cauliflower florets absorbs all the flavours of spices. You can completely skip this step if you are short of time and proceed to next step. Line the baking sheet/tray with aluminium foil and arrange the cauliflower florets in single layer. Place the baking sheet/tray in mid rack and set the timer for 10 minutes. After 10 minutes, take out the tray and gently turn over the florets and bake them again for 7-10 minutes. The florets should be well cooked and tender when pricked with a sharp knife or fork. Transfer to serving bowl and drizzle freshly squeezed lime juice to taste. 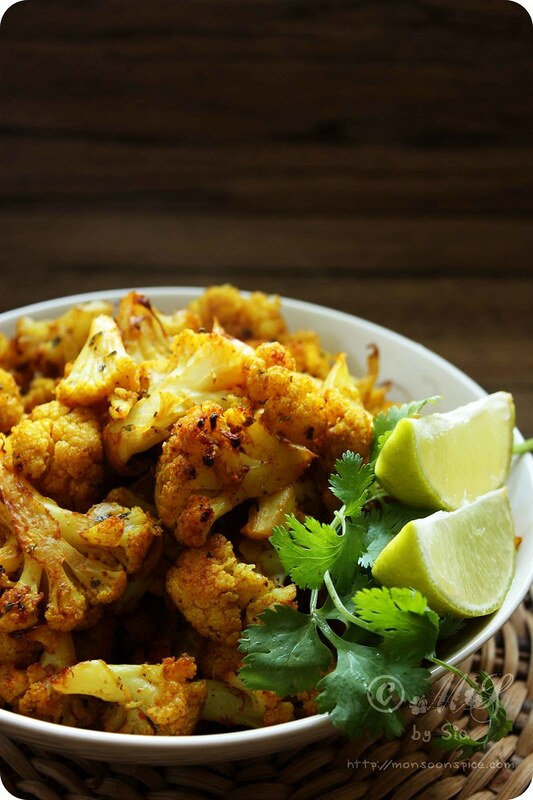 Garnish with coriander leaves, if desired, and serve this Spicy Gobi/Cauliflower Roast hot with any flavoured or plain rice or with any Indian flat breads and Dal, a lentil dish and enjoy. Read the notes below to see other serving suggestions. If you have time, let the florets marinate in spices for 15-30 minutes for real depth of flavour. 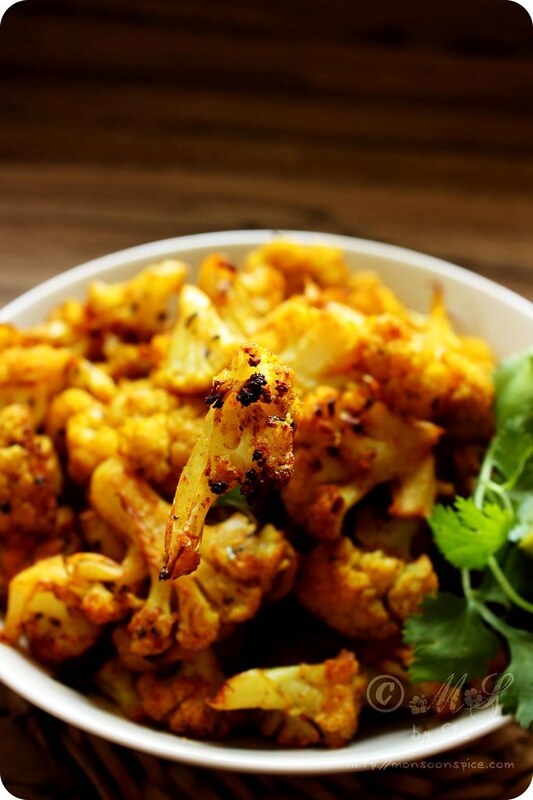 You can serve this Spicy Gobi/Cauliflower Roast with any plain of flavoured rice or with any Indian flat bread. I have used the Spicy Gobi/Cauliflower Roast in wraps with a spoonful of sour cream and salad leaves and it tastes absolutely delicious. You can also use it as a stuffing with Pita bread, some fresh vegetables like sliced onion, tomato, cucumber and few lettuce leaves. Top it with any of your favourite relish or dipping sauce. Put them in a zip lock bag and you can freeze them up to 2 weeks. When needed, just take it out of the freezer and pop it in an oven (make sure that they are spread in single layer) and cook for 10 minutes at 180 deg C.
Do you want to win a copy of Helene Dujardin’s Plate to Pixel, food photography bible for amateur or for even experienced food photographers! Just head over to my blog anniversary post to read about how you can participate in this Giveaway. This giveaway is open for everyone and the prize will be shipped worldwide!!!! The giveaway is open till this Friday 7th October, 2011. So what are you waiting for? Please hurry up!!! Love such simple and flavourful recipes! Amazing what a handful of Indian spices can do to a simple vegetable roast! Mouthwatering! That is a great way of cooking cauliflower. 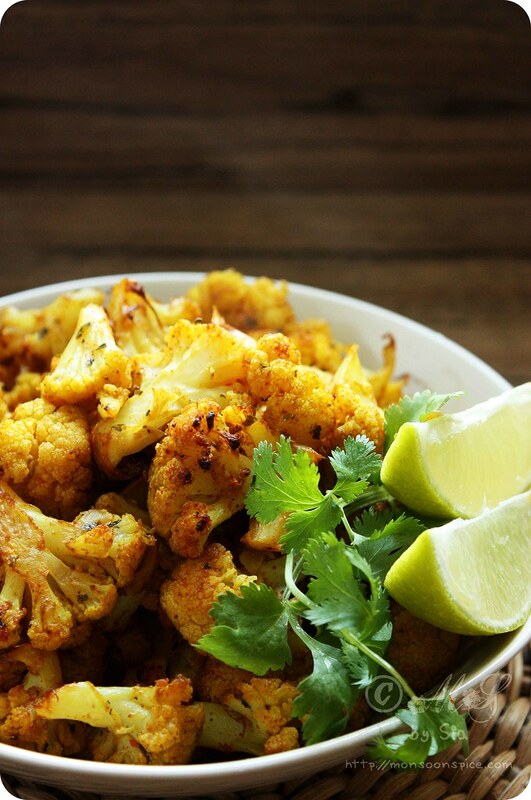 Wow - this roasted cauliflower is loaded with flavors! Sounds delicious. 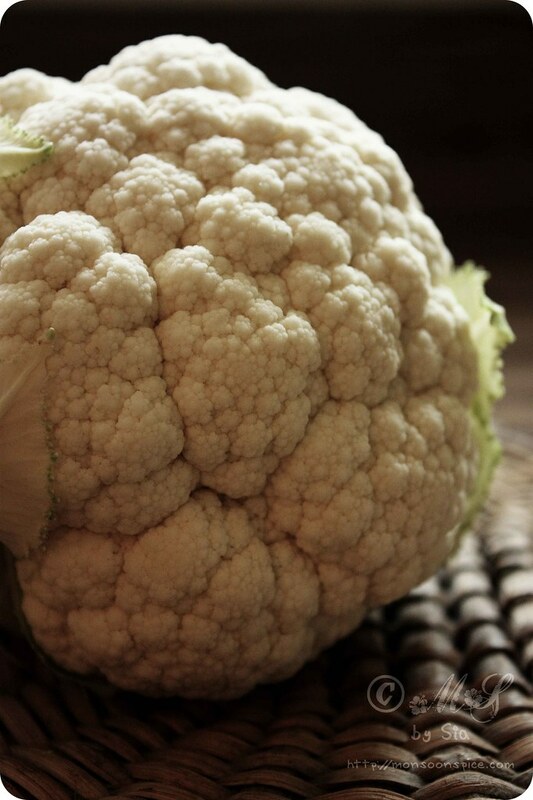 Saving it for my daughter who loves cauliflower. Hey Sia.......as always lovely clicks....will try soon.....do stop by and see my oven baked version of aloo gobi mutter.....im sure u will love it...if u love baking!! I love gobi which is prepared this way! And what GORGEOUS photos, I didn't know that gobi could look so beautiful! Cool Sia. Lovely shots and thanks for posting this gem of recipe. Looks amazing, am sure it tasted amazing too! I'm not a huge fan of cauliflower except when it's used to prepare gopi manchurian. But the pics of your healthy roast and an eyeball of the ingredients tell me I'm gonna like this. Btw, how did you manage the first shot of the single floret..? Lovely! I am wondering how you took the pic of the floret that seems to be suspended in the air! You know what? This just made me change my dinner plans. It's roasted cauliflower tonight! How can I print your recipes? I don't see any print icon. Thanks. Hey Sia, tried this recipe and it was wonderful. I skipped kitchen King masala & dry ginger powder, added minced garlic & ginger instead. After baking for 10 mins, I broiled it for 8 mins at 500 degrees. My 3 year old loved it :-) thanks a lot for sharing this wonderful recipe.